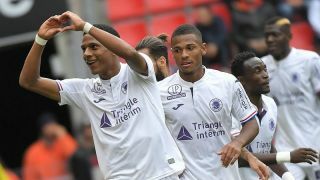 Barcelona transfer target and Toulouse starlet Jean-Clair Todibo is reportedly hoping a deal can be struck immediately for him to move to the Nou Camp. The 19-year-old has only made 10 appearances in all competitions so far this season, but with his current contract set to expire in the summer, he has reportedly attracted plenty of attention. Given he has decided that he won’t renew with the Ligue 1 outfit, he has been snubbed from the last six match-day squads as it appears as though his future now lies elsewhere. According to Mundo Deportivo, Barcelona are leading the race for his signature, while it’s added that the talented starlet hopes that the Catalan giants can wrap up a deal to sign him next week by paying a fee rather than waiting for a free signing in the summer. It’s suggested that an announcement could perhaps be made early next week, but with no agreement in place yet, it’s difficult to predict whether or not that will come to fruition as it’s suggested talks will continue. Time will tell whether or not talks between the two clubs end with an agreement being reached, but adding defensive reinforcements seems like a sensible idea for Barcelona in their pursuit of multiple trophies this season. Although they lead the way in La Liga, Ernesto Valverde’s men have conceded 19 goals in 17 games so far this season, giving them the joint-second worst defensive record of the top seven sides in the standings. Samuel Umtiti’s injury problems haven’t helped, although Sky Sports note that the club did sign Jeison Murillo from Valencia on loan until the end of the season. It remains to be seen how Todibo’s possible arrival would affect him, but Barcelona would certainly be adding plenty of quality and depth for the short term and long term if they completed two defensive signings this month.